A green haven in Ilocos Norte awaits people longing for the healing power of nature as a shield to the scorching heat this summer. The newly-opened park in the town of Nueva Era also provides glimpses into the local ‘Tingguian’ culture while enjoying a day or two relaxing in cottages made of indigenous materials or tree-shaded picnic grounds. Nueva Era is about an hour drive from Laoag City via the Dingras road. It is the next town from Banna, and bordered by Kalinga, Apayao, Abra and Ilocos Sur on the east, southeast and south. A flat, rolling and mountainous terrain, the municipality has a total land area of 644.70 square kilometers and is the biggest town in the northern part of Ilocos Norte, where most of its people are speaking the Tingguian dialect. The Nueva Era Eco-Cultural Park and Tribal Village, which opened early this year, features distinct traditions of the Tinguian community, from tribal huts and tree houses to tribal costumes, and to known practices such as the performance of ‘Tadek’, traditional dance of the Tingguians. They have a little museum showcasing the Tingguian culture and at the back is a lovely setting for weddings and events, hanging bridge, and, a swimming pool for picnic-goers. 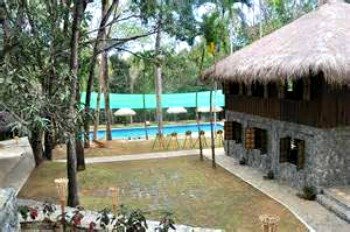 Aside from the tree houses, there are also huts and bungalows with basic but comfortable accommodation facilities including beds and an electric fan. They also have a campsite for those who want to take their adventure outdoors to a higher level. The park also has a bonfire area or ‘dap-ayan.’ There are trails and nearby treks for those who want to hike. Plus a restaurant is in the works to serve local delicacies and Ilocano cuisines such as Bagnet, Longganisa, Poque-poque, Dinengdeng and some exotic food cooked from a “Deer” meat or locally known as “Ugsa”, that is included in the menu. Nueva Era Mayor Aldrin Garvida and Ilocos Norte Governor Imee R. Marcos developed the new tourism site in support of the provincial government’s effort to promote local tourism industry. Inspired by the successful implementation of eco-tourism development in Kota Kinabalu, Malaysia where Marcos along with a group of mayors and department heads visited last year, the eco-cultural park is also a boost to the province’s economy by creating more jobs and alternative livelihood for the locals.